For months, you've been bombarded with images of golden, perfectly roasted birds, gorgeous homemade pies, and picture-perfect table settings. Every magazine and television program seems convinced that on this one day of the year, we all must unleash our inner Martha Stewarts to whip up veritable feasts with nary a dirty dish in sight. This pressure, combined with the reality that we may be hosting (ahem) difficult relatives, puts many people into a total tizzy this time of year. Before you throw in the towel, let me make a bold statement: hosting a Thanksgiving dinner needn't be a stressful occasion. It can actually be a lot of fun. It's all about perspective and planning. 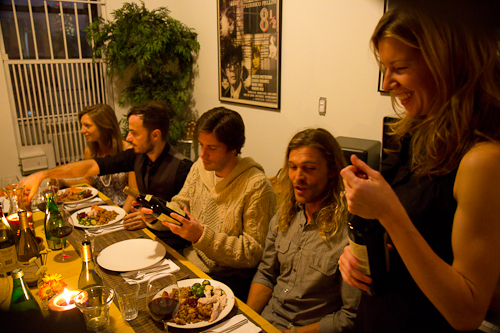 Though my husband and I live in a fifth-floor walk-up, with a kitchen the size of a shoebox, we hosted Thanksgiving for 12 friends and family last year. Yes, there was a lot of work-shopping and cooking and set-up (and probably a day's worth of dishes after!) -- but it was by far one of the most memorable and rewarding experiences of my life. Why? I realized through the experience is that it doesn't matter how beautiful a Thanksgiving day table may look -- it's who's around it that counts. 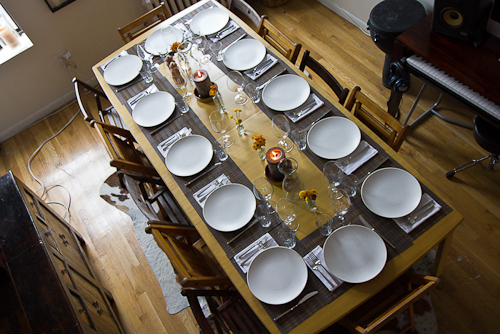 The picture below is from last year's Thanksgiving, before the guests arrived. The food and the table settings (the things I obsessed over for weeks) didn't begin to compare with the sounds of laughter and clinked glasses and stories told, and the sight of so many people I love enjoying the meal and each others' company. We are having friends around the yellow table again this Thursday, and I cannot wait. This year, instead of focusing on making every detail of the Thanksgiving meal picture-perfect, I am spending time reflecting on the meaning of Thanksgiving. I'm trying to think about what it means to live a life of thanksgiving -- not just celebrate one day with a big turkey and a ton of food. In our crazy busy lives, it is so easy to lose sight of what's important and to forget just how blessed we are, when we focus on what we don't have. Having this perspective takes so much pressure off pulling off the "perfect" Thanksgiving (which of course doesn't exist outside magazines). But perspective aside, a little planning certainly doesn't hurt. Set your table the night before. In fact, do as much as you can a day or two before-pick dishes that you can make in advance (check out the menu below for ideas) and reheat just before guests arrive. Don't try and make everything yourself. Last year I went all out and made the turkey, eight side dishes, and two pumpkin pies. It about killed me. This year, I'm doing the turkey and a few sides and asking my guests to each bring a favorite side dish or a dessert and a bottle of wine. Going potluck is brilliant because you won't get stuck with all the cooking -- and the cost. Plus guests love to feel like they've contributed something to the meal. 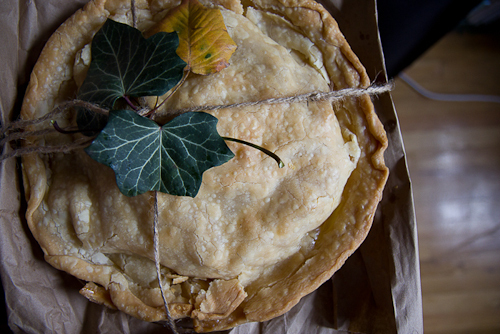 Last year, a friend brought the lovely pie below. Keep the menu simple. There may be 10 fabulous new recipes you are dying to try, but Thanksgiving is not the time to try them all. Ask someone to come early and bring appetizers so guests have something to nibble on when they arrive. That way you can put the finishing touches on the meal and everyone can have a drink and mingle in the living room. This is actually a really nice way to break the ice before everyone sits down at the table (and it buys you a good hour or so!). 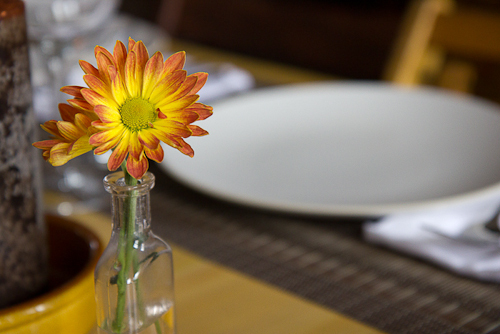 Impressing your guests should not be your goal. This is Thanksgiving-it should be a time of warmth and family and friends. Make sure everybody is comfortable, but remember this is actually supposed to be fun for you too! Think about which dishes can be made in advance (the more the better! ), which ones will need the oven, which can cook on the stove top, and which need to be chilled. The timing of Thanksgiving can be tricky since the turkey is in the oven for several hours leading up to the meal, and there are usually other dishes that need to go in the oven too. There is no shame in ordering some of your food from a restaurant or a grocery store. Maybe you hate cooking turkey -- order it! Or make the turkey and pick up a pumpkin pie at a local bakery. Enjoying your guests is the goal, and they would rather have a relaxed you than an over-the-top meal that keeps you chained to the kitchen all day. 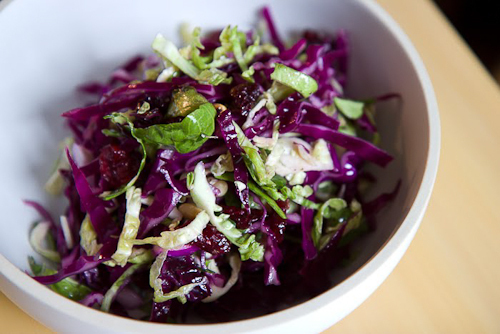 Try and incorporate some simple, healthy side dishes into your Thanksgiving menu. Guests are guaranteed to bring fattening casseroles and desserts, so balance things out with some deliciously healthy veggie sides (see below for recipes and ideas). That way you'll feel energized after the meal instead of comatose. Consider asking a friend to stay after and help with the dishes in lieu of bringing food, or hire someone for a couple of hours the next day to come help with clean-up. For me, this is the biggest stress-reliever of all-not having to do all the dishes myself! Keep a bottle of bubbly in the fridge and have a glass before guests arrive. Remember to have fun-otherwise why bother hosting? At the end of the day, Thanksgiving is about being thankful. For the gift of life and the many gifts that life brings. I am looking forward to celebrating all of this not only this Thursday, but every day. We have no idea how many days we have left, so give thanks today.